My new interactive podcast debuts tonight at 6pm (PT)! For info on how to catch it, and even join the live interactive chatroom, click here! 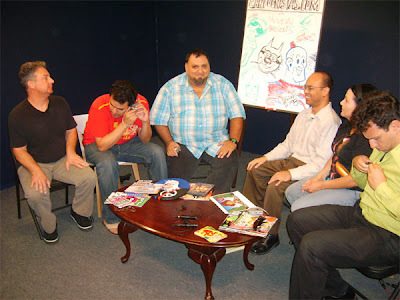 Yesterday, (Saturday,August 23) me and some of the Cartoonistas taped on interview for a local cable access show. 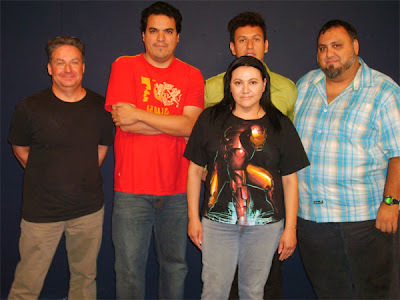 The Nuvein Foundaation, the non-profit organization that promotes Literature and the Arts in the San Gabriel Valley, hosts an occasional show called NUVEIN PRESENTS. Well, this time around they wanted to feature the Cartoonistas in one of their interviews, so the call went out and 'Bamf', there we were! One thing about the Cartoonistas: You put a blank drawing surface in front of 'em and they attack it like flies on....um...fly food? Grasiela and me before the grueling interview! Prepping for the interview on the Nuvein Presents studio. Um, why is Jim Lujan taking a call on his camera?! Our host for the show was Renato Aguirre. 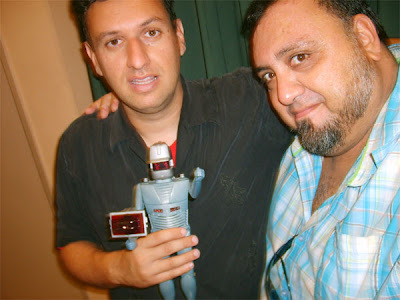 Renato is my fellow Producer on PLANET COMIC BOOK RADIO and actually does the editing and write-up for each episode. He's also one of the Board Members of Nuvein. He had a fun time interviewing the whole bunch of us. 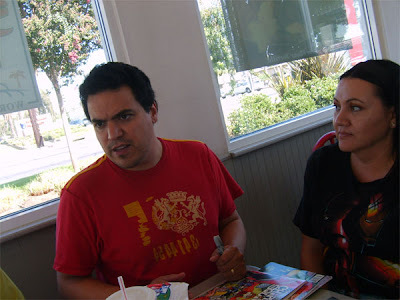 After the interview, we headed over to a Tommy's Burger stand and did the other thing the Cartoonistas are heralded for: Eatin'! 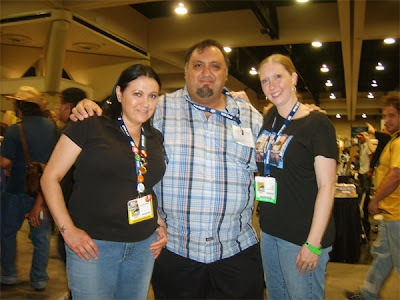 This turned into a Micro-Con when Jimmy Lujan asked us all for copies of our work! Why support your fellow artists by purchasing their work when you can hit 'em up for free copies at lunch?! Real classy there, Mr. Co-Founder!! 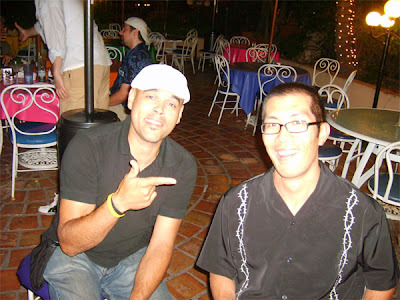 One of the things we do as Cartoonistas, besides holding eating jams and promoting ourselves non-stop, is having intelligent conversations about the art and philosophy of comics: Here Jim Lujan weighs the merits of who swims better: Aquaman or Michael Phelps! Yes, the rumors are true (Well, I'm spreading it here! )...I've got a new blogcast called JAVILAND. I'm still doing my weekly show PLANET COMIC BOOK RADIO, but this podcast will actually be interactive where you could either call in or join the chat room...in real time! Why start another podcast? Well, I've found lately that several people have been asking me for some pointers about self-publishing (actually over the years Iget questions about this). And I don't mind helping people, but there's not enough time in the day to be emailing different folks at different times to be schoolin' them in the ways of self-publishing. I figure with this new podcast, I can talk about my own experiences and let others join in with questions or comments via the live chat. Plus the shows will be archived and anyone can listen to them at their leisure and hopefully get some good info about DIY publishing. Also, I've been listening to, and participating in, a couple of new podcasts recently on the TALK SHOE.COM site and I like the format of the shows. Having a real-time venue to discuss storytelling and publishing with other comic creators over internet radio is a win-win situation, as far as I'm concerned. So with these reasons in mind (and the obvious opportunity to talk of one's own work doesn't escape me) I thought I'd start JAVILAND. While my other show, PLANET COMIC BOOK RADIO will still continue to feature interviews with independent comic creators and other proponents of the comic book culture, JAVILAND will allow me to focus on specific issues or topics that relate to either my own comic creation or those of other artists, and allow listeners to interject with their own questions and experiences. The first episode is scheduled for Sunday, August 31 at 6pm (PT). The show will podcast live, so if you'd like to listen in, or even join the chat, go to my TALK SHOE page and register an account (it's real simple and quick). Episodes will be archived on the site, and I believe I should be able to get the episodes listed on iTunes. I'll be using the JAVILAND blog to post news on the show, the links to each podcast, and show notes for each episode. JAVZILLA will remain my blog for news, reviews, pics, etc on everything I do! 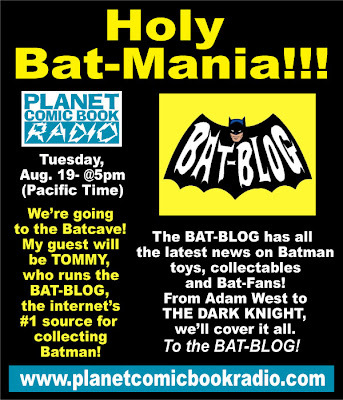 Bat-Mania on PCBR August 19! 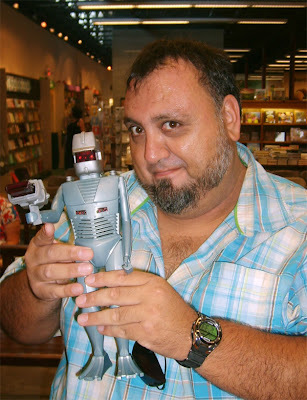 ROM, SpaceKnight...He lives! He walks! He conquers! Yep, it finally happened! 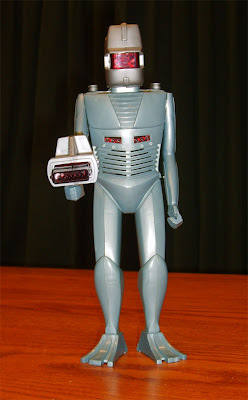 I got my hands on a ROM action figure today!! My friend Michael Aushenker, (cartoonist, writer, bon vivant) has a major article on the 1970s Marvel Comic ROM, Spaceknight coming up in the January issue of BACK ISSUE. 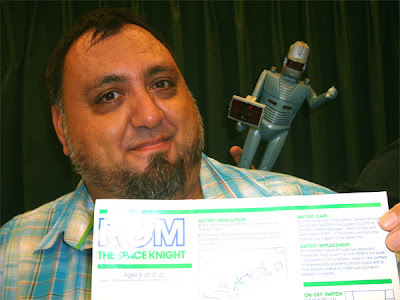 He was looking for a good photo to accompany his article and I informed him that our mutual friend Steve Ross had an actual ROM toy in his collection. 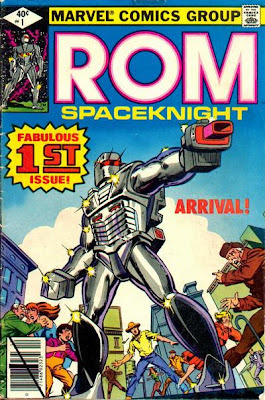 ROM, the toy, apparently bombed when it came out, but the Marvel Comic book based on the property continued on for over 5 years!! The series was written by Bill Mantlo with art by Marvel Bronze Age mainstay, Sal Buscema, then later by Silver Age legend Steve Ditko. The book was definitely a favorite of mine when I was in my formative comic collecting days. The character design was unique in it's day, and the story of a man becoming a cyborg and sacrificing himself to save his planet, and traveling to Earth to eradicate the evil Dire Wraiths was for me more exciting than any sci-fi movie could be at the time (sorry STAR WARS!!). So Mike contacted Steve Ross and asked if we could shoot his Rom figure. Steve said yes and so me and Mike traveled to Pasadena to meet Steve at the bookstore he works at and began to photograph Rom right there at the desk where the store does there presentations and signings! 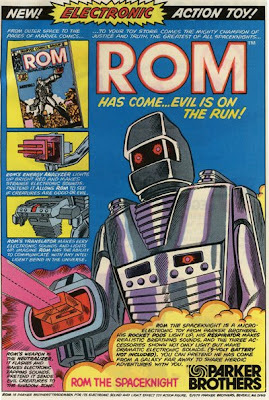 One of the really cool things about the Rom comic was whenever Rom exposed one of the Dire Wraiths hiding amongst the human race he would vaporize them with his Neutralizer! HE EXTERMINATED AN EVIL ALIEN RACE...in a kids comic!! (Okay, so he was really just vanquishing the Wraiths to Limbo, never to return again. But the way the Wraiths would fear the Neutralizer and the screams of horror they would utter when 'neutralized' was spectacular!!). 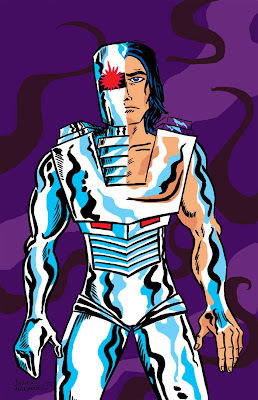 The original Terminator folks: half-man/half-machine and 100% exterminator!! It's nice to grow up and be able to give something back to the great times one had growing up as a fan. I was able to give my own homage to Rom when I contributed a pin-up to a Rom gallery show in Portland last December. 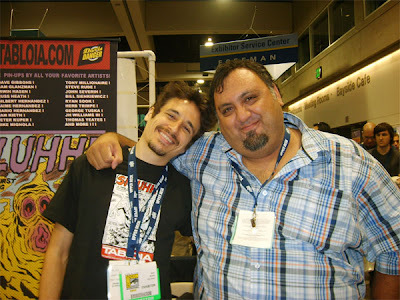 And I was fortunate enough to interview writer Bill Mantlo's brother Mike on my radio show in January. So, to all the Rom fans out there (and I know they are out there, like so many Dire Wraiths, waiting, waiting....), enjoy this little tribute to Rom, the greatest of the SpaceKnights! And here's a brief clip of a song 'ROM, Spaceknight" by HB3! Go to iTunes and buy the song!! Thanks to Steve Ross for sharing his cool toy with us! And great lunch, eh? I'll be returning as a guest to TALK OBJECTIVISM today at 5 pm (PST). Today I will be joined by author Blake Bell (Strange and Stranger: The World of Steve Ditko) and my friend Mort Todd, who hired Ditko when he was the Editor-in-Chief of CRACKED magazine, as well as an editor at Marvel! I was actually on the show last week as well. I was only going to preview today's episode but I ended up talking about Ditko for over an hour! 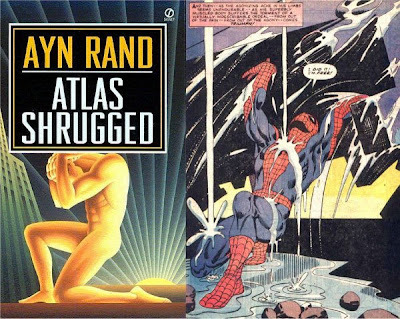 TALK OBJECTIVISM is a show dedicated to the philosophy founded by Ayn Rand, of which Ditko has been a follower of for decades. I had emailed the host of the show, Jason Mosley, and told him about Steve Ditko. He invited me to come on his show and talk about Dikto's work (Ditko co-created Spider-Man with writer Stan Lee) and how he's incorporated Objectivism in his comics. If you want to listen to today's episode, just click on the above link. You can even join the Chat Room with a quick registration and participate in the show. And here's acclaimed comic book writer Alan Moore talking about a song he once performed based on Steve Ditko and his legendary creation, MR. A! 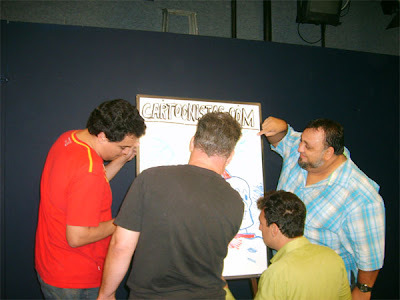 CARTOONISTAS meeting on Friday night was extremely fun and eventful! On Friday night, Aug. 8, we held a meeting of the CARTOONISTAS, a local group that I co-founded with animator/cartoonist Jim Lujan. Our goal was to create an art group of sorts, or a gathering of area artists brought together as a networking tool. Really though, it's more fun to describe it as a cartoonist clubhouse! Thanks to Jim for recording the clip! 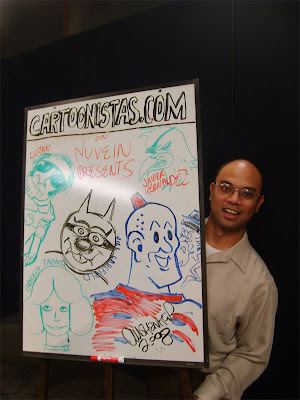 Check out the Cartoonistas blog for more pix and even more exclusive behind-the-scenes video! 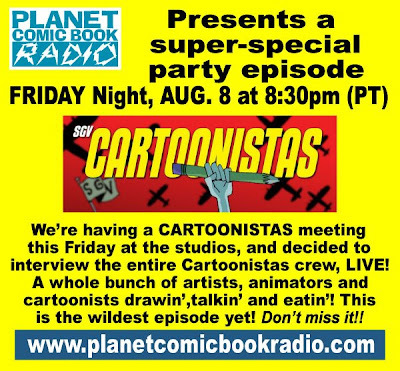 Super special PLANET COMIC BOOK RADIO podcast this Friday! 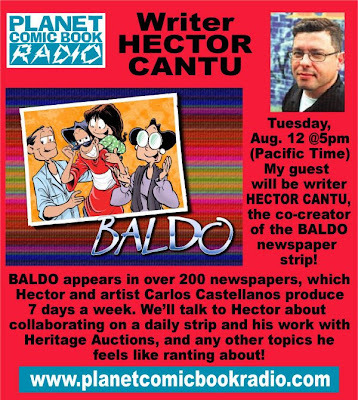 First time I've done two PLANET COMIC BOOK RADIO shows in one week! And it will be my 4th radio appearance this week!!! I will be interviewed live on Kevin Cross's Blogcast on Thursday, August 7 at 4pm (Pacific Time). An added bonus will be that you can either call in or participate in the chatroom while the interview is going on! 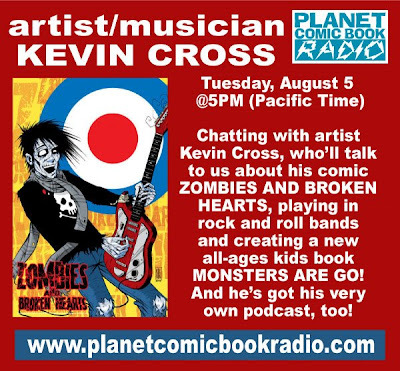 Kevin Cross is the cartoonist who I just interviewed on my radio show this past Tuesday! (As of this post, the interview hasn't been added to our website yet). Kevin's Blogcast is new, he's got four episodes under his belt. He puts on a pretty good little show, though. He'll talk about his current comics projects, but also has a feature spotlighting urban monsters and another segment where he talks about classic animated shows like THUNDARR and MIGHTY MIGHTOR! And being a musician, Kevin has all kinds of music throughout his episodes. I'll be his first interviewed guest, so that's pretty cool. And it's funny to me that two days after I had him on my show, I'll be the subject on his show! His show is hosted on TALK SHOE.COM, the same outfit that hosts the TALK OBJECTIVISM show I was a guest on this past Sunday (Episode 071). It's a simple matter to register for the show, which allows you to listen and interact with the live podcasts. If you want to hear my interview live, and ask me any questions, log on about 10 minutes before show time and register. It's a quick, simple process. Well, here's a different type of appearance for me! I was a guest on TALK OBJECTIVISM, a podcast that discusses the philosophy founded by Ayn Rand (author of THE FOUNTAINHEAD and ATLAS SHRUGGED). How, and why, was I a guest on the show? Glad you asked! As readers of this blog probably know, I'm a big fan or Steve Ditko (his Spider-Man is shown above). 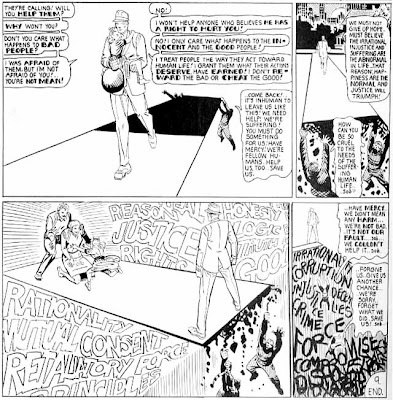 Ditko, besides being one of comic's true great talents, has been a follower of Objectivism for most of his life. Much of that philosophy has found it's way into his comic book work, particularly his independent/self-published work (MR. A being a prime example). Over the years I've always been curious about Objectivism, since it's been such a prevalent influence in Ditko's work. 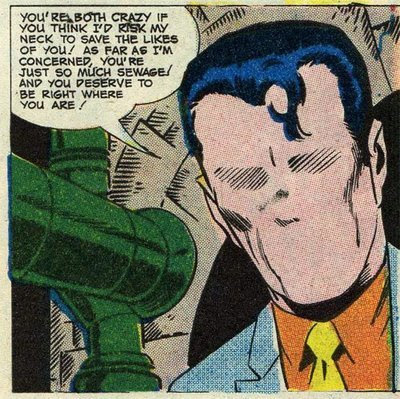 When Blake Bell, the author of STRANGE AND STRANGER: THE WORLD OF STEVE DITKO appeared on my radio show, some of the questions I asked him were about the Randian influence in Ditko's work. In the interest of learning more about Objectivism, I found the TALK OBJECTIVISM site and started listening to the podcast via iTunes for the last couple of weeks. I immediately found the show interesting because of the host, Jason Mosley. I was hoping the host wouldn't be some stuffy, pedantic, academic stiff, because that would put me to sleep. Mosley is a graphic artist, who maintains a blog about bacon (! ), he's a tech-nerd, and even does an online comic-strip. He's what I call a regular guy (only a comic-creating, blogging geek like me would think that, right?!). He's been into Objectivism for about 4 years, and is learning as he goes along. So for me, his view on the philosophy, while he's dedicated to it, is coming from the point of view of someone finding his way into it. As there are things about Objectivism that don't fit in with my world view, I can listen to his show without feeling preached to about the philosophy. So anyway, I emailed him to tell him all this, and asked him if he was aware of Steve Ditko. I gave him some background on Ditko's work on Spider-Man and his own Objectivist heroes like The Question and Mr. A. Mosley was quite interested in all of this, and soon we are talking about me appearing on his show to talk about Steve Ditko! I was happy to do it, of course. Not because I fancy myself a Steve Ditko expert, or even a representative, but I figured I knew enough about Ditko's history to lend my opinions and share some knowledge. Plus for me it was an opportunity to appear on a talk show and not necessarily promote my own work (not that I'm shy about that!). As a Ditko fan, I thought it would allow me to expose more people to his work, and that gives me satisfaction. So anyway, I spoke on the show yesterday, and it's now available on the TALK SHOE site as Episode 071 (you can also download via iTunes). 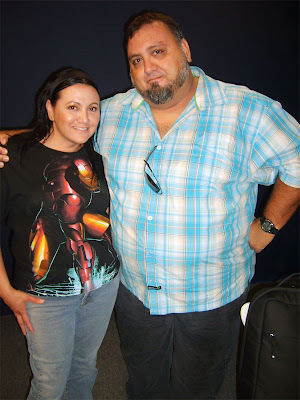 I had a really great time talking on the show with Jason and his regular guest Arthur. They were genuinely interested in Ditko's work. Plus it allowed me to talk with them about various philosophical issues, and some political talk. Please check it out and let me know what you think. By the way, I'm going to be on the show again next Sunday, this time with Blake Bell making an appearance! I'll be there to ask Blake some questions specifically how Ditko's Objectivist views shaped his run on The Amazing Spider-Man, as well as how it affected his other work. In the meantime though, I have to get ready for my own guest on my own show tomorrow! 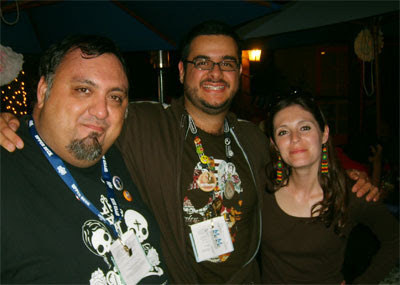 Comic Con 2008- I MADE IT!!! I arrived in San Diego late Saturday, about an hour before the Ditko panel. Actually, as soon as I got off the bus in front of the Con, I ran into three friends I knew! One guy introduced to his friend, and after I introduced myself this person realized I was the guy who created EL MUERTO, which delighted both of us! I have to say, despite not being able to exhibit, and knowing I was only going to be at Con for less than 10 total hours, walking in the front doors always gives me a big rush. 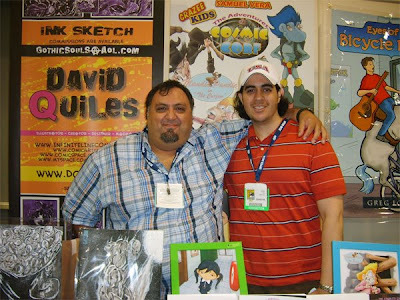 I attended Con for about 6 years until I became an exhibitor, so unlike many publishers/cartoonists I have memories of San Diego far beyond trying to sell books (which I love doing, of course). Once inside, I tracked down some friends at their Small Press tables and then made my way to the Ditko panel. I introduced myself to Blake Bell, telling him that he was a guest on my radio show a few weeks back. 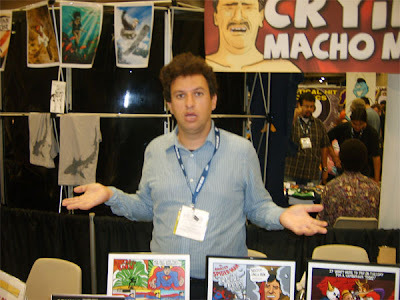 (Thanks to Blake for mentioning me on his Comic Con report!). His panel included artist Jim Starlin, Marvel editor Carl Potts, Fantagraphics publisher Gary Groth and Kim Deitch. All had good insights and stories about Dikto. After the panel I made my way down to the floor and visited more friends. One of the other main reasons for attending the Con was to make our annual trip to Old Town after the show. We've been going for years now, a whole group of cartoonists and friends and spouses making our way to a secret location for a feast of Mexican food and pitchers of strawberry margaritas! In an outdoor patio to boot! It's really at this dinner that I get such a sense of euphoria of being involved in the comics biz. Just sharing great moments with some really good friends; some new, some I've known for a longer while. 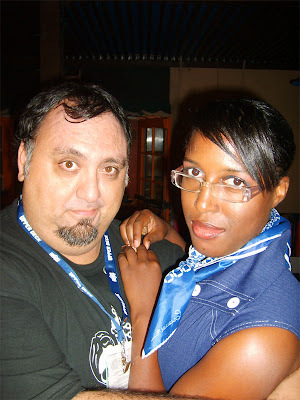 Alex here is a long-time fan and friend I met at Comic Con some years ago. Jose and his wife Blanca have just moved to San Diego from Chicago. How convenient is that? 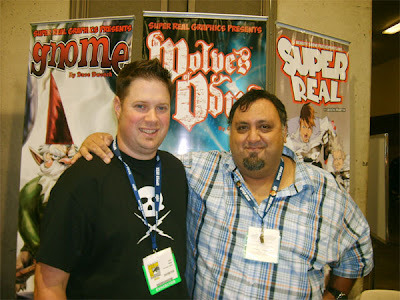 I originally met Jose a few years ago when I had a Message Board at El Muerto.com. We had never met before in person until earlier at the convention center. He's always been an extremely supportive fan, and I always had a good sense of him as a person just by his posting on my Board. When we met we carried on like we've been friends for years. Which we have, actually! other side if hall hosted more of the media outfits like movie studios, cable networks, video game makers, toy companies, etc. And this is the side that was choked with 1000s of people blocking the isles and trying to get glimpses of movie props or grab the freebies being handed out! 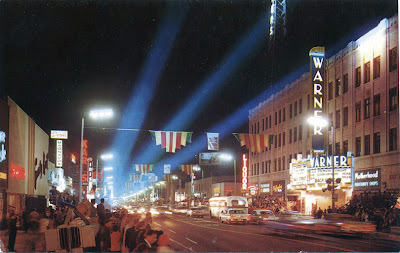 I swear this place was unmanageable when I walked through it! 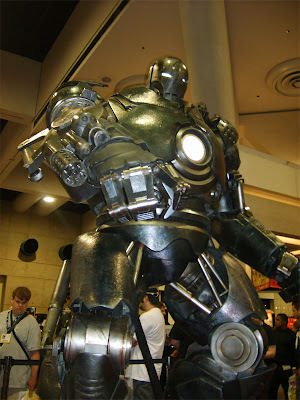 I did manage to take this pic of the IRON MONGER from IRON MAN. Geez, imagine if this thing started going berserk amongst all the people! 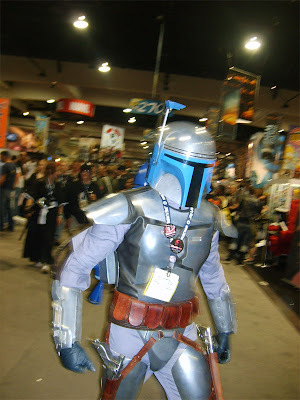 I saw this Boba Fett (or is it Jango??) and tried to take his picture, but then he stormed off! Oh well, if he's reading this: I don't care about Star Wars anyway!! 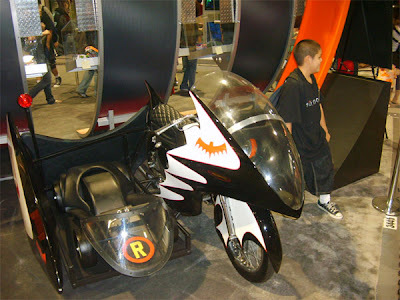 What I do care about is the old Adam West BATMAN, represented here by the Batcycle. You younger fans can have your Batpod or whatever it's called in the DARK KNIGHT! Long-time friend and cartoonist compadre Michael Aushenker wonders how he got bamboozled covering the CRYING MACHO MAN table! 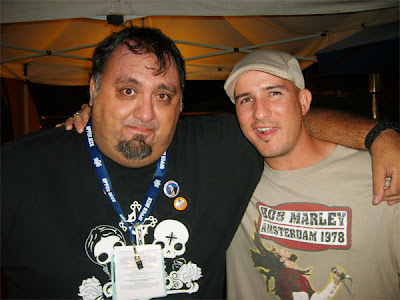 I was very happy to finally meet New Jersey's powerhouse Puerto Rican comics/podcast mogul, Samuel Vera! Sammy and I exchanged visits on one another's podcast earlier this year, and I wrote the intro to his THERE'S AN ALIEN IN MY TOILET traderpaperback....He told me when he received it that it brought a little tear to his wife! Awww, that's sweet! 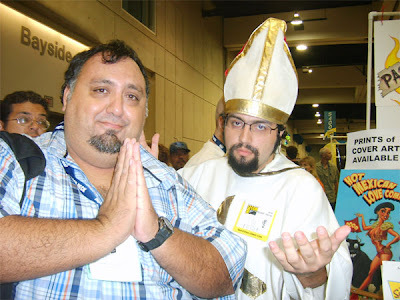 Ran into the Space Pope in Small Press and went into Good Catholic-mode! Chris Wisnia, creator of DORIS DANGER and TABLOAI, has charmed his way to a guest slot on PLANET COMIC BOOK RADIO in the near future! Like I said, I had a great time seeing old friends and new friends. The plan is to apply for a talbe early, early, early...... But for now, the memories I made at this year's Comic Con will hold me over for awhile.